An intraocular lens (IOL) is a tiny, lightweight, clear plastic disk placed in the eye during cataract surgery. An IOL replaces the focusing power of the eye's natural lens. The lens of the eye plays an important role in focusing images on the retina. If the lens loses its clarity, as it does when a cataract develops, light rays do not focus clearly and the image one sees is blurry. Glasses or contact lenses cannot sharpen vision if a cataract is present. 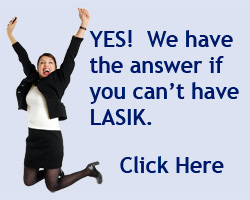 The only treatment for a cataract is to remove the lens and implant an IOL. Intraocular lenses have many advantages. Unlike contact lenses, which must be removed, cleaned, and reinserted, the IOL remains in the eye after surgery. An IOL may be placed either in front of or behind the iris. Behind the iris is the most frequent placement site. They can be hard plastic, soft plastic or soft silicone. Soft, foldable lenses can be inserted through a small incision which shortens recovery time following surgery. Rapid evolution of IOL designs, materials, and implant techniques have made them a safe and practical way to restore normal vision after cataract surgery.